The Timberline Wrens (Thryorchilus browni) are found in the mountains of Costa Rica and Panama. 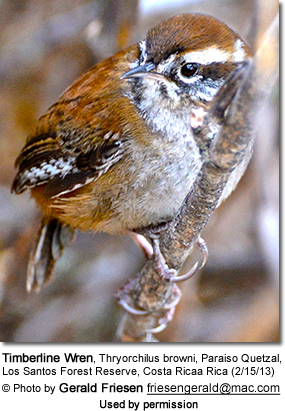 The range of the Timberline Wrens stretches from central Costa Rica south to western Panama. These high-altitude wrens occur at elevations from 7,200 - 11,800 feet (~ 2,200 - 3,600 meters). They inhabit moist montane forests, bamboo thickets in the páramo zone, and forest edges at the treeline. Rufous upper plumage; whitish below. White wing markings and white supercilium (line above each eye). Their diet largely consists of insects. These cavity nesters will make their nests in tree cavities or in crevices. They may take advantage of nestboxes.